Calling all Call of Duty fans, this shirt is perfect for you! Comfortable in design, this short-sleeved top is high-quality and is created for the ultimate COD fans. 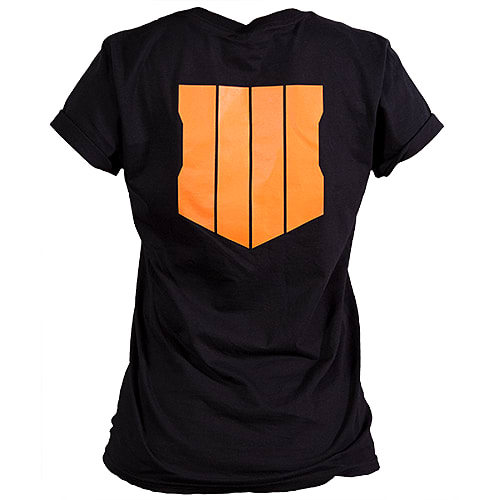 This unisex shirt has the Call of Duty: Black Ops 4 logo on the front at the top right and the recognizable orange symbols on the reverse of the shirt. These symbols are associated with the Black Ops series and really stands out from the crowd. Can’t wait to play the game? Buy the Call of Duty: Black ops 4 Announce T-Shirt today. Looking forward to the new Call of Duty game? Buy the Call of Duty: Black Ops 4 Announce T-Shirt today! After the exciting reveal, we know you’ll be looking to get more of your Call of Duty: Black Ops 4 fix and this t-shirt can offer you exactly that. This comfortable but simple shirt is designed with the logo at the top right and the iconic Black Ops symbols on the back of the shirt. Show your excitement for the new video game and buy the Call of Duty: Black Ops 4 Announce T-Shirt today.